This year’s Port Wine Festival was as usual held at Børsen, Copenhagen, on the 2nd of November. This year João Nicolau de Almeida from Ramos Pinto visited, and he talked very warmly about the Douro table wines, especially their own Duas Quintas that celebrates 25 years in 2015. It is without doubt a very good wine and the red reserva shows a fantastic ageing potential. João should know all about making good red table wines as it was his father Fernando Nicolau de Almeida that created Barca Velha, the best red wine from Portugal. If you like port wine and haven’t tried out the table wines from the Douro you should do so because the quality is better for each year. For Port lovers like us it was of course also very nice to taste the 1983 Vintage Port which was actually the first Vintage Port that Ramos Pinto made where they had kept all grape varieties separate until making the final blend. The wine is fantastic today, very elegant and delicious but still with power and it shows some soft tannins, see tasting notes here. There were as usual a lot of port wines to taste from many different Danish importers. Maybe because both 2012 and 2013 are a bit weaker vintages compared to the amazing 2011 Vintage there were not many new, really young vintages to taste. On the other hand several fully mature Vintage Ports could be tasted. Grahams 1983, Dow’s 1985, Quinta do Infantado 1985 were some examples that could be tasted. 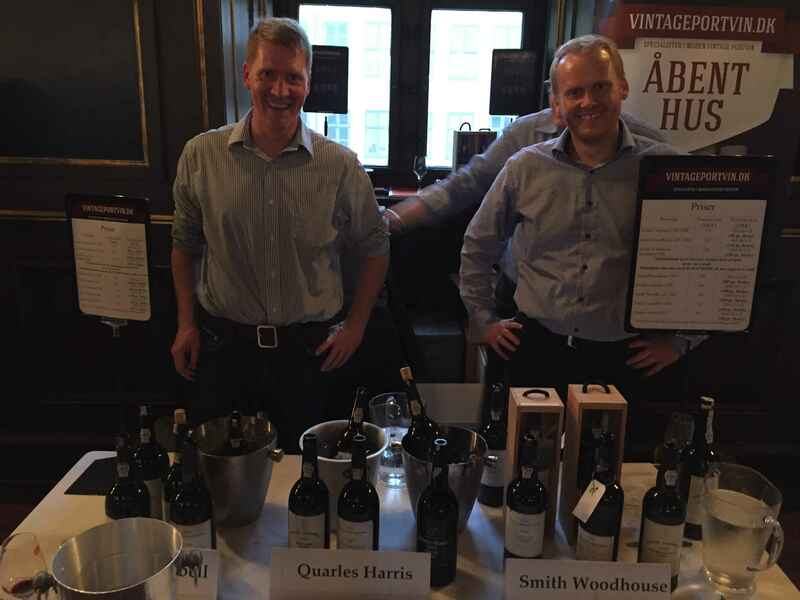 The two brothers Jens-Peder and Troels from Vintageportvin.dk were offering some of the best mature Vintage Ports this year. 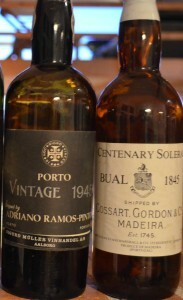 They had a range of six mature Vintage Ports. Both Gould Campbell and Smith Woodhouse from 1980 and 1985, all four very good and still with some power and soft tannins to make them last for another couple of years. Gould Campbell is a bit rounder and elegant with a very nice complex body, whereas Smith Woodhouse show more power and dark berries from the very dark coloured wine. Vintageportvin.dk also served a very nice Madalena Vintage 1996 from Smith Woodhouse. Finally, the best, the Quarles Harris 1977 Vintage Port; this is wonderful today, peaking and showing all you want from a mature Vintage Port. We must give our very best recommendations of Vintageportvin.dk to anyone seeking for a mature Vintage Port. As usual the Festival was a great success and we would like to thank Mr. Oldenburg for continuing this tradition and hope to see you all again next year! This entry was posted in Producer, Tasted Vintage Port, Wine tasting and tagged João Nicolau de Almeida, Port Wine Festival, Ramos Pinto on November 15, 2015 by Stefan. Forlaget Smag is arranging the annual Port Wine Festival at Børsen, Copenhagen on Monday November 2. Henrik Oldenburg is as usual the man behind the Festival and we have been informed that João Nicolau de Almeida from Ramos-Pinto will be this years special guest. There will as usual also be many more representatives from port producers during the festival. 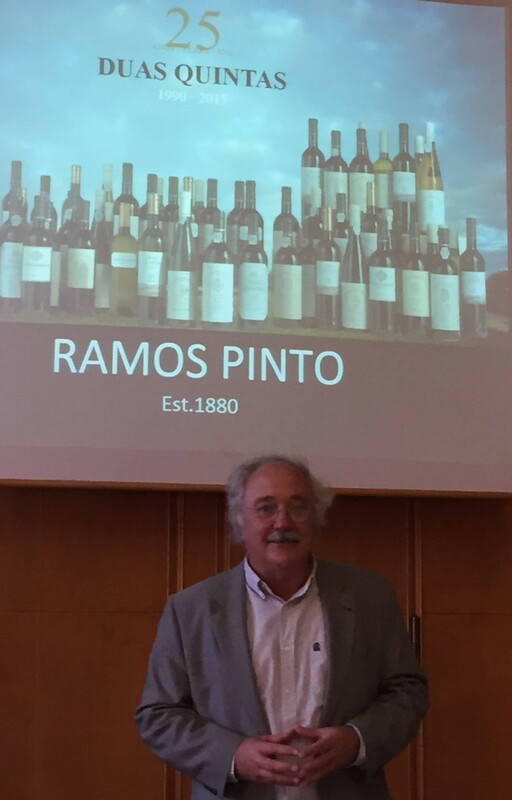 This entry was posted in News and tagged Port Wine Festival, Ramos Pinto, Tasting on August 31, 2015 by Stefan. Due to a Birthday within the family we went to Skagen, Denmark to celebrate. We started already at home, 3 days before with Reichsrat von Buhl’s Forster Ziegler Riesling Auslese 1945 as aperitif which was delicious indeed. After that Grand Cru Moenchberg Riesling from Guy Wach, Alsace to the first course, followed by Ch. Latour 1987, Ch. Haut Brion 1975 and Ch. La Misson Haut Brion to the main course. La Misson was outstanding indeed. A marvelous wine after 40 years to enjoy today and it will keep for some years more. To the dessert we followed up with F. Martin’s vintage 1977 and 1982. When we arrived in Skagen we started the celebration with Bollinger Vielles Vignes Francaises, Blanc de Noir 2005 because we dared not to take too old wines with us in the car. It was a truly marvelous champagne and the first time we drank it. After that, before eating, we had another Champagne, 2004 Brut, Grand Cru from Petit-Lebrun just to make sure to feel that celebration week had started. To the first course we had Moutonne Grand Cru 2003 from Dom. Long-Depaquit, Chablis. The wine was elegant as always. After that Ch. La Misson Haut Brion 1997 and Clos de la Roche, Grand Cru 1998 from Vicent Girardin, Morey St. Denis and ended up with a dessert and Silval Vintage 1999 from Noval and Calem Vintage 1960. Next day the evening started with a new lovely and elegant Champagne from Bollinger; their R.D. Extra Brut 1996. We continued with a Riesling 2012 Grand Cru Frankstein, Dom. Mersiol from Alsace and a white Ch. Latour Martillac 2011, Grand Cru Classe from Grave. To the meat we enjoyed Corton – Clos de la Vigne au Saint 2006 Grand Cru from Louis Latour, and Ch. Palmer 1985 and ended the evening with Ramos Pinto Vintage Port 1945 and a Madeira, Bual Solera Centenary 1845 from Cossart Gordon. Both wonderful wines. The next day we started with Henriot champagne vintage 1996 (excellent) and continued with Riesling, Grand Cru Wineck-Schlossberg 2008 from Albert Schoech, Alsace and Les Fourneaux Prem. Cru 2011 from Louis Moreau, Chablis. The meat was enjoyed with Corton -Le Rognet Grand Cru 2006 from Maison Ambroise and Ch. Beychevelle 1975 both really mature and exciting. This evening we ended with Wiese-Krohn Vintage port from 1967 and 1965. The 4th of August we started the evening with a wonderful champagne from Michel Gonet, Vintage 1996 and the paté was enjoyed with a marvelous Ch. d’Yquem 1973. To the grilled salmon we had Riesling Grand Cru Altenberg de Wolxheim 2013 from Arthur Metz, Alsace and Gewurtztraminer Grand Cru Kirchberg de Barr 2004 from Dom. Hering, Alsace. 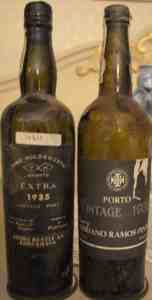 The ports this evening were Messias’ Quinta do Cachao Vintage 1966 and 1976. The next day we started with two champagnes. The first bottle was Cuvee Cleo Blanc de Blanc from Esterlin which was followed with the Vintage 1996 Cuvee Fleur de Champagne from Duval-Leroy. How lucky we were! The wine to the first meal was Riesling Grand Cru Rangen 2008 from Wolfberger, Alsace and the entrecôte was enjoyed with Ch. Leoville Barton 1980 and Ch. Leoville Poyferre’ 1962, both wonderful and mature. Now we had no more port left so to the dessert Ch. Doisy Daëne 2007 and Bernkasteler Doktoren, Riesling, Beerenauslese 1976 from Lauenburg was drinking well. On the 6th of August the champagne was vintage 2008 from Louis Roederer. The paté was enjoyed with Riesling Auslese Steinberger 1976, Staatsweingut and Ch. Suduiraut 1990. The meat was accompanied with Lacryma Christi del Vesuvio Reserva 1999 and “Les Crais” Prem. Cru 2009 from Camille Giroud, Gevry-Chambertin. Due to weight increase no dessert wines this evening. The last day in Skagen the champagne was Huré Frères Blanc de Blanc from 1996. We continued with a Gewürztraminer Grand Cru Prelatenberg 2012, Alsace and Rauenthaler Baiken’s Riesling Auslese from 1976, Staatsweingut. The meat was enjoyed with Clos de Mouches 1986, Prem. Cru from Joseph Drouhin, Beaune and Cabernet Sauvignon Bella Oak vineyard 1982 from Heitz, Napa Valley. Both wines perfect mature and wonderful to drink. The day was lucky for us because we found a cheap Rozes Vintage Port in Skagen and the 2010 was a perfect ending of an unforgettable week. This entry was posted in Dinner, Tasted Vintage Port, Travel and tagged Calem, Champagne, Quinta do Cachao, Ramos Pinto, Rozes, Silval, Wiese & Krohn on August 11, 2015 by Stefan. We have had a wonderful winter with some excellent tastings. In February the Wine Society 18% in Malmö had a Semi-Great tasting (i.e. below 20 houses) of the vintage 1984, which we have already written about here. You find all our larger tastings in the special section for Great Tastings. In March we had a very interesting tasting of all seven vintages from Quinta do Vesuvio in-between 1989-1996 in the Danish Port Wine Club est. 1981 in Copenhagen. They were all very wonderful and many of them still needs some more age in the bottle. On the 18th of March i.e. after 3 years 2 months and 18 days we had our 100.000 visitor on our web-site. These visitors have been from more than 150 different countries! 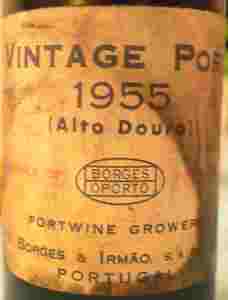 We are very surprised, but of course also happy, to see that Vintage Port seems to be popular all over the world! Easter started on Thursday and we started with Mercier vintage 2004, elegant and tasty and Ch. Mouton Rotschild 1993 with the duck breast, which was quite good and attractive. 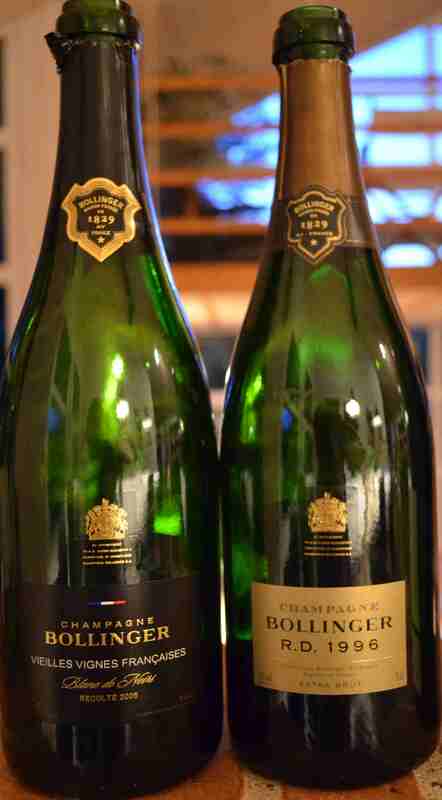 Good Friday we started with Belle Époque vintage 1990. Then we had lobster with Alsace Grand Cru Engelberg Riesling vintage 2010 from Dom. Pfister and Ch. Bouscaut vintage 2008, Grand Cru Classe from Grave. The main course was horse filet which was accompanied with Ch. Lafite Rothschild 1985 and Ch. Margeaux 1985 and the dessert was accompanied with vintage port of course. 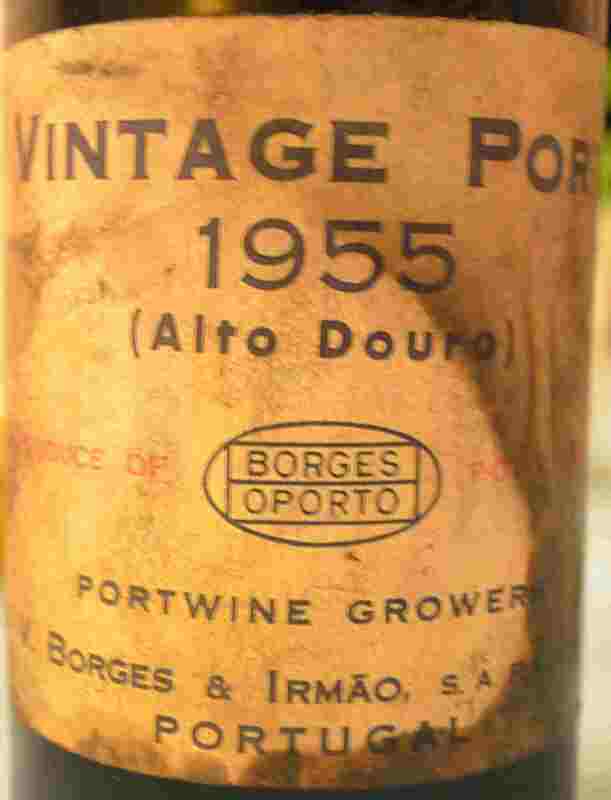 They were 1955 Borges which was old, turbid and when decanted, it looked like a white port in the beginning but muddy and terrible at the end. The cork was from Borges but said 1980!? This was not good at all. 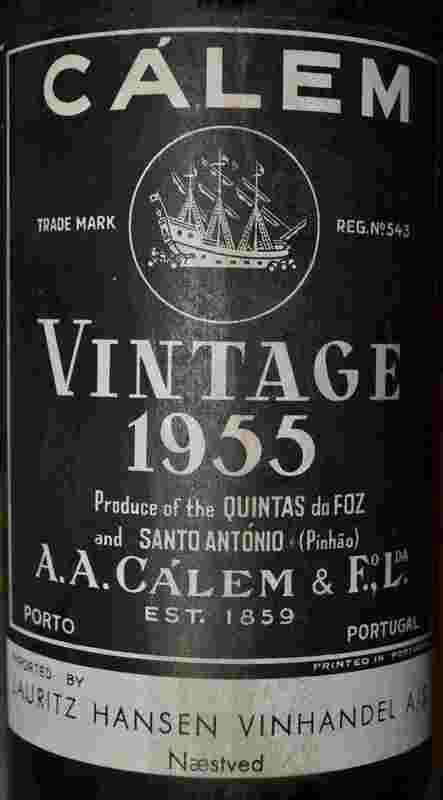 The other vintage port was Calem 1955 produced by Quinta da Foz and Santo Antonio and it was delicious. Easter Eve we started with de Venoge’s Grand Vin des Princes vintage 1993. With the pâté we had Scloss Johannisberg Riesling, auslese, Cabinet from 1893 (sic), still knit together but of course a bit dry which we maybe had expected and Ch. Filhot, Sautern from 1904 still wonderful sweet and very attractive. With the lamb we enjoyed Ch. Cheval Blanc 1985 and Ch. 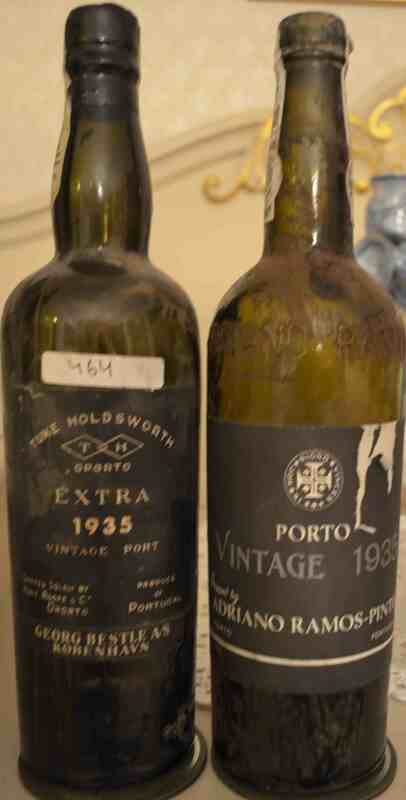 Latour 1985 and with the dessert we had 2 very mature and delicious vintage ports, Tuke Holdswoth 1935 and Ramos Pinto 1935. We had a nice night‘s sleep after that. 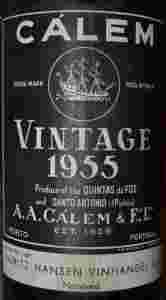 This entry was posted in Dinner, News, Tasted Vintage Port, Web site stats and tagged 1935, 1955, Borges, Calem, Ramos Pinto, Tuke Holdsworth on April 9, 2015 by Stefan.